I hope you have the next “Strictly Vintage” market in your diaries – it’s a bargain $5 entry for some of the best vintage traders around, in the beautiful Deco surrounds of the Northcote Town Hall – plus I’m presenting a free talk on 1930s ladies fashions! Where: Northcote Town Hall, top of Ruckers Hill, High St, Northcote. Tram out the front, Merri and Westgarth train stations nearby. More information at the Strictly Vintage Facebook page. – See here. My new book “Style is Eternal” should be available and I’ll be signing copies – here’s one of my favourite lace ’30s evening gowns, one of the many pieces I’ll be talking about on the day – modelled by St Clare. 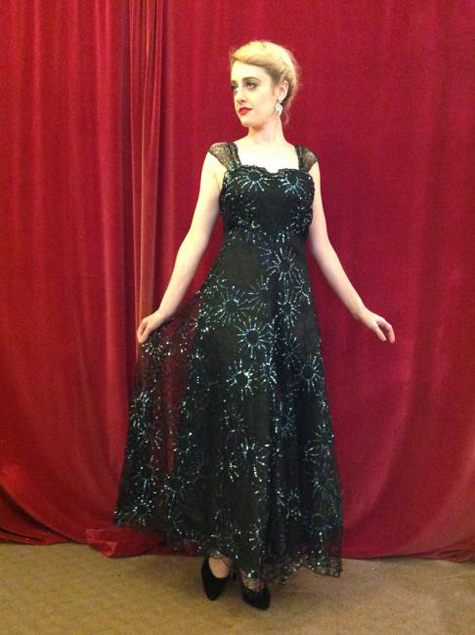 This lovely gown is made of spiderweb lace, sewn with iridescent blue gelatine sequins. There are still some stalls available – if you’re interested in joining us, please contact Rina at Take 2 Markets. It promises to be a wonderful day! The evening dress is charming!I like the dress embellished spiderweb lace and iridescent blue gelatine sequins.It’s nice to have one.